A Guide to Nearsightedness (Myopia), Farsightedness (hyperopia) and Astigmatism. Often referred to as nearsightedness, myopia is the most common focusing problem. Myopic individuals can see near objects clearly but have difficulty seeing far away. 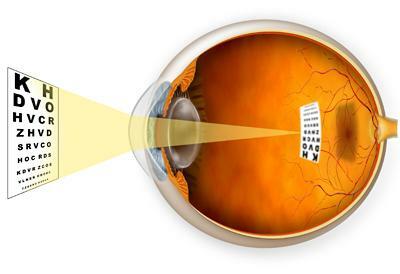 Myopia results when light rays focus in front of the retina. The cause is often a cornea with too much curvature (i.e., too much focusing power) or an eye that is too long. When a laser is used to treat myopia, it gently flattens the contour of the cornea, which lessens its focusing power and allows light to focus farther back, directly on the retina. Hyperopia is more commonly referred to as farsightedness and is the opposite of myopia. Those who are farsighted have difficulty focusing on distant objects and are even blurrier up close. A cornea that is too flat or an eye that is too short results in farsightedness. These conditions cause the light rays to focus at a point behind the retina. When a laser is used to correct hyperopia, it gently steepens the contour of the cornea, which increases its focusing power and causes the light to come into focus directly on the retina. Astigmatism often occurs along with nearsightedness or farsightedness. 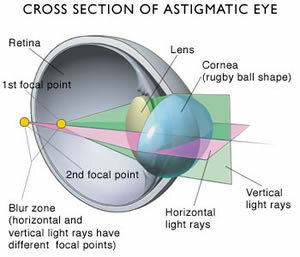 With astigmatism, light entering the eye from different directions is focused different amounts. For example, light entering vertically (from 12 o'clock to 6 o'clock) may be focused more than light entering horizontally (from 9 o'clock to 3 o'clock). 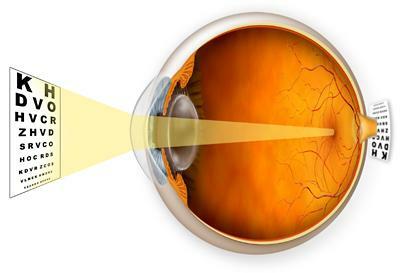 In an eye without astigmatism, light is focused the same amount in each axis. The net result of astigmatism is blurred vision. Often letters appear slanted or have tails. Sometimes, the affected eye sees double. In practical terms, astigmatism is treated similarly to nearsightedness and farsightedness, but with different amounts of treatment on each axis.